Your spine is the most important set of bones you have. Not only does it support your head, it also supports your entire body. The structure is connected to your rib cage, which protects most of your vital organs, including your heart and lungs. It also protects your spinal cord, which is a bundle of nerves that links your brain to the rest of your body. The spine is divided into 4 sections : the cervical spine (neck), thoracic (chest/trunk), lumbar (low back), and sacral (pelvic area) (1). The cervical spine is built for flexibility to allow a vast range of motion for the head while the lumbar spine is built for the power of your abs and the flexibility of your hips while the thoracic spine is built for the stability of your rib cage (2,3,4). The lumbar spine takes most of the strain caused by heavy lifting and long periods of sitting. It’s the most common source of back problems, including pain that radiates to the legs or feet. The sacral region is also prone to pain since it’s made up of 5 fused segments of bone that deteriorate in times of stress, malnutrition or lack of physical activity. Spinal health is influenced by activity level and muscle strength. Your muscles support your spine and keep it in its natural position so skipping out of the gym can worsen your posture and cause bone pain. 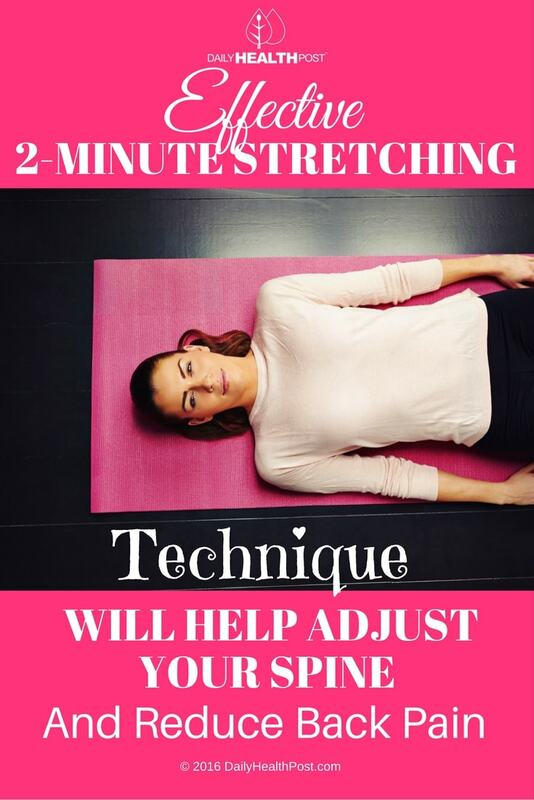 Regular stretching, body weight exercises, and proper posture are all important for supporting your spine. However, despite our best efforts, your spine can take a hit from sitting all day or being stressed. Regular massages and chiropractic treatment will definitely help, but there are simple routines you can do at home to help readjust the spine and minimize back pain. This pose will loosen up tight muscles in the lower back and upper legs to take the tension off your spine. All you need is a yoga strap or long belt and a yoga mat. Lie down on your back with feet firmly on the floor at hip’s distance apart. Place your hands to your side with your palms facing the ceiling. Rotate your pelvis inward so that the small of your back is touching the floor. Take out your strap and wrap it around your right foot so that it is resting just under the ball of your foot. Straighten your right leg upwards and hold each end of the strap firmly. Walk your hands upward on the strap so that your arms are almost straight. Try to keep your leg directly above your hip throughout the exercise. Hold for a few breaths. Next, repeat the stretch with your right leg and slowly straighten your left leg outward so that it is touching the floor. Keep your hips straight and keep both legs in line with your hips. Repeat with the left leg, extending the right leg on the ground. Release and bring your legs into your chest, wrapping your arms around them and gently rolling yourself side to side. Repeat as needed in times of pain.